Neither John Force’s rat-tat-tat sponsorship spiels nor Courtney Force’s slightly naughty nudie magazine layout could convince Ford Racing to continue its team support programs in the NHRA’s Mello Yello Drag Racing Series beyond 2014. That’s one way to interpret Ford’s stunning decision to concentrate its drag racing dollars on NHRA’s grassroots and Sportsman racers beginning in 2015. Announced during the 26th annual NHRA Sonoma Nationals in California last weekend, Ford’s decision directly will impact the Ford Mustang-bodied Funny Car programs of John Force Racing, Tasca Racing and Tim Wilkerson Racing as well as Larry Morgan Racing’s Pro Stock Mustang. Fifteen-time Funny Car world champion John Force presides over a family-based juggernaut that includes former world champion/son-in-law Robert Hight and daughter Courtney, as well as fledgling Top Fuel driver/daughter Brittany. JFR has enjoyed a 17-year alliance with Ford that is one of the most productive in the sport’s history. 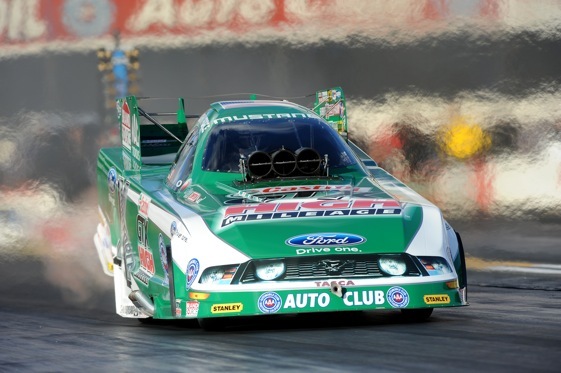 JFR Mustangs have won 42 percent of the NHRA tour events in which they have participated (156 of 373) since the start of their Ford affiliation in 1997. Ford’s Funny Car teams certainly have been delivering for the manufacturer this season. Heading into this weekend’s 26th annual O’Reilly Auto Parts NHRA Northwest Nationals in Kent, Wash., near Seattle John Force (fourth), Courtney Force (tied for sixth) and Hight (10th) all are eligible for the Countdown to the Championship, NHRA’s six-race playoff that will begin on Sept. 13. Wilkerson (eighth) also is headed to the playoffs, while Tasca III is 11th, three points behind Hight, one round out of ninth and two rounds out of eighth. On the pop culture front, Courtney Force generated plenty of traditional headline buzz and social media chatter when she graced the national cover of “ESPN The Magazine’s” 2013 so-called Body Issue. Tasca III, grandson of legendary Rhode Island Ford dealer Bob Tasca Sr., has led the racing branch of his family since 2008. When he’s not involved with his Ford Shelby Mustang racing team, Bob III still works at the family dealership. Allison acknowledged that severing those long-term family relationships was particularly tough. “We made a business decision as we evaluated the Pro/Nitro level in the sport this past year, reviewing our investment, the returns from activation, television ratings and overall product/technology relevancy,” Allison said. “It is vital that we align our motorsports at Ford to closely match our global products, technologies and customer outreach, especially in this ever-changing automotive world. Again, we want to reinforce Ford’s continued and deep commitment to the roots and foundation of NHRA and drag racing, in the Sportsman level in the sport. “In drag racing, we will continue with production of our highly-successful Mustang Cobra Jet race cars and will continue to support Ford racers with engines/parts support and contingencies in many of the popular classes. “We have built and sold 200 Cobra Jets so far and we will deliver another 50 this year. We also have the most rewarding contingency program of any manufacturer in drag racing that pays for the success of any Ford, no matter the model year. We offer generous payouts for wins and championships for Cobra Jet racers that are second-to-none. In addition to NHRA, we also post contingencies in NMRA and NMCA drag racing for our loyal customers. At Sonoma last weekend, John Force reminded his team and fans of what the Blue Oval has meant to the growth and development of JFR, especially in the aftermath of the death of Eric Medlen from injuries suffered in a crash while testing at Gainesville (Fla.) Raceway in March 2007. JFR Mustangs have been responsible for almost 75 percent of Ford’s NHRA Funny Car victories (156 of 219) and almost half (49.3 percent) of all Ford wins at the professional level (156 of 316 in Funny Car, Pro Stock and Top Fuel). JFR Fords have won 11 of the last 16 NHRA series titles. “We’re proud of what we’ve done on the track,” said Force, first drag racer to be voted Driver of the Year in 1996. “But I’m more proud of what we did off the track. With Ford’s help, we completely redesigned a Funny Car chassis that hadn’t changed in 25 years and we helped make the sport better for everyone, not just the Ford teams. Force noted that he felt lucky to sign one-year sponsorship deals with Wendy’s and Jolly Rancher at the launch of his touring career in the 1980s. “I still have a job to do and I never count on just one sponsor to make JFR a success,” Force said. “(The Ford people) were a big help with the chassis program and I can never thank them enough for all the safety help, but I have to look at the big financial picture. Tasca and Wilkerson also issued statements, with the former considerably less politically correct than Brut Force. “For Ford to make a decision to pull out of professional drag racing, I truly believe they have underestimated the passion and loyalty of the NHRA fans,” said Tasca, whose ties to Ford theoretically could make it difficult for him to align with a rival manufacturer. Grandfather Bob Tasca Sr. founded Tasca Racing in 1962, one of the first businessmen to capitalize upon the potential of “Race on Sunday, Sell on Monday” during drag racing’s infancy. Bob Sr. opened his Ford dealership at age 27; 70 years later, Tasca Ford is run by the family’s second and third generations. Allison said Ford would continue to support grassroots/enthusiast drag racing, sports and touring car racing, stock car racing, off-road racing, stage rallying and action sports worldwide. “We review all our motorsports programs regularly to ensure they are relevant and returning good ROI for the company and supporting our outreach to our fans and customers,” Allison said. “We’ve upped our NASCAR efforts this season with the addition of Penske Racing in Sprint Cup and Nationwide and also expanded our Global Rallycross program in alignment with the debut of Global X Games earlier this year. WHAT: 26th annual O’Reilly Auto Parts NHRA Northwest Nationals presented by Super Start Batteries, the 16th of 24 events in the NHRA Mello Yello Drag Racing Series, at Pacific Raceways, Kent, Wash. SCHEDULE: Friday_ Professional qualifying at 2:45 and 5:30 p.m.; Saturday _ Professional qualifying at 12:30 and 2:30 p.m.; Sunday _ Pre-race ceremonies, 10 a.m.; eliminations begin at 11 a.m.
TELEVISION: Saturday, ESPN2 and ESPN2HD will televise 90 minutes of qualifying highlights at 10:30 p.m. (EDT). Sunday, ESPN2 and ESPN2HD will televise three hours of coverage starting at 7 p.m. (EDT). 2012 EVENT WINNERS: Steve Torrence (Top Fuel); Courtney Force (Funny Car); Erica Enders-Stevens (Pro Stock). MOST VICTORIES: John Force, seven (Funny Car); Bob Glidden, six (Pro Stock); Joe Amato, five (Top Fuel); Tony Schumacher, four (Top Fuel); Warren Johnson, four (Pro Stock). TRACK RECORDS: Top Fuel _ 3.802-seconds by Tony Schumacher, July ’08; 322.19 mph by Schumacher, July ’10. Funny Car _ 4.056-seconds by Robert Hight, July ’08; 308.85 mph by John Force, August ’11. Pro Stock _ 6.531-seconds by Jason Line, August ’11; 211.69 mph by Allen Johnson, August ‘11. NATIONAL RECORDS: Top Fuel _ 3.701-seconds by Antron Brown, October ’12, Reading, Pa.; 332.18 mph by Spencer Massey, April ’12, Concord, N.C. Funny Car _ 3.986-seconds by Jack Beckman, October ’12, Reading, Pa.; 320.58 mph by Beckman, October ’12, Reading, Pa. Pro Stock _ 6.471-seconds by Mike Edwards, April ’13, Concord, N.C.; 214.35 mph by Jason Line, October ’12, Reading, Pa.
Top Fuel _1. Shawn Langdon, 1,210; 2. Spencer Massey, 1,108; 3. Tony Schumacher, 1,106; 4. Doug Kalitta, 924; 5. Antron Brown, 904; 6. Khalid alBalooshi, 865; 7. Clay Millican, 769; 8. Morgan Lucas, 768; 9. Bob Vandergriff Jr., 726; 10. Steve Torrence, 688. Funny Car _ 1. Matt Hagan, 1,034; 2. Ron Capps, 1,007; 3. Cruz Pedregon, 983; 4. John Force, 961; 5. Johnny Gray, 945; 6. (tie) Jack Beckman, 910; Courtney Force, 910; 8. Tim Wilkerson, 804; 9. Del Worsham, 799; 10. Robert Hight, 782. Pro Stock_ 1. Mike Edwards, 1,339; 2. Allen Johnson, 1,273; 3. Jeg Coughlin Jr., 1,147; 4. Shane Gray, 948; 5. Vincent Nobile, 918; 6. Jason Line, 902; 7. Greg Anderson, 821; 8. Erica Enders-Stevens, 743; 9. V. Gaines, 742; 10. Rodger Brogdon, 660. Pro Stock Motorcycle_ 1. Hector Arana Jr., 795; 2. Matt Smith, 646; 3. Michael Ray, 599; 4. Hector Arana, 553; 5. John Hall, 534; 6. Scotty Pollacheck, 523; 7. Eddie Krawiec, 465; 8. Adam Arana, 462; 9. Shawn Gann, 428; 10. Steve Johnson, 424. This is a terrible decision. I have purchased dozens of Fords over the years, backed them with loyalty in many arguments as to who is the best manufacturer, complained that they were not competitive in pro-stock, and this is how they treat us. I CANNOT BELIEVE THIS. THANKS FOR NOTHING FORD. Mr. Beachner: Your comment is typical of the Ford fans among my Car Guy friends. I’m assuming that for 2015 John Force Racing will wind up with a new manufacturer _ Toyota? _ because he needs to keep the business up-and-running for his family-oriented organization. Similar family ties might make it tougher for Bob Tasca III to break with Ford…but what choice does he have if he wants to continue racing in Funny Car? And I’m thinking Tim Wilkerson likely will follow JFR’s lead as far as a manufacturer. In Pro Stock, Larry Morgan’s Mustang program basically has been non-competitive with the Chevrolet and Dodge efforts, so I would assume he will have to find another manufacturer or exit NHRA.